Upgrade any CardioChek PA or Plus analyzer to newest Plus at a reduced price if old unit is mailed back to us w/payment YOU MUST CALL to order. 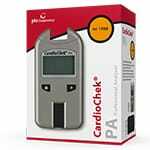 New CardioChek Plus will not ship until old unit is received by us. Test strips are sold separately. MemoChip pictured ships with test strips and will change color depending on the test panel. Which Analyzer is right for me? 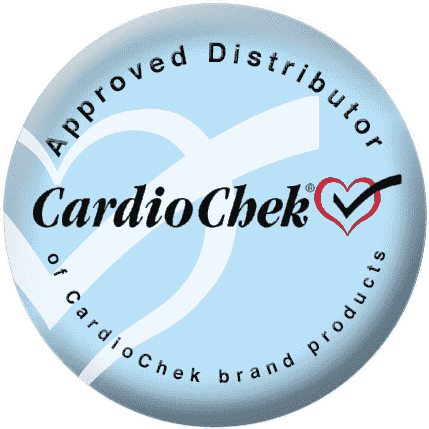 Customers with a used white or silver CardioChek PA or older model CardioChek Plus devices are eligible for the upgrade program to the new CardioChek Plus meters. 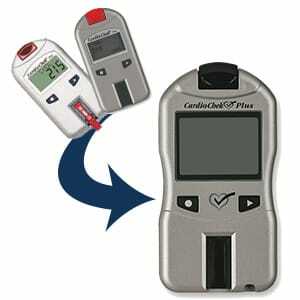 Call Test Medical Cholesterol Sales Division at 888.595.3136888.445.0030. The cholesterol sales team will issue a Returned Goods Authorization (RGA) number and process your order. Why do I want to upgrade? does not require the use of HDL controls. Only uses Multi-Chem controls. can be used with the new CardioChek Printer (lightweight model). 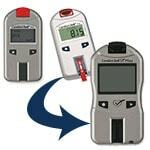 can be used with the CardioChek Link Software and Cable. Please Click here for more information on the new features of the CardioChek Plus. How does the upgrade process work? After placing the order online or by phone 888.595.3136888.445.0030, Test Medical will issue a Return Goods Authorization (RGA number). This RGA documentation will need to be sent with the used white or silver CardioChek PA. Once Test Medical has received the used CardioChek PA along with the correct paperwork within 30 days of the RGA, TMS will send out your new CardioChek Plus. Test Medical Symptoms At Home, Inc. reserves the right to cancel this program at any time. Test strips must be purchased at regular price.